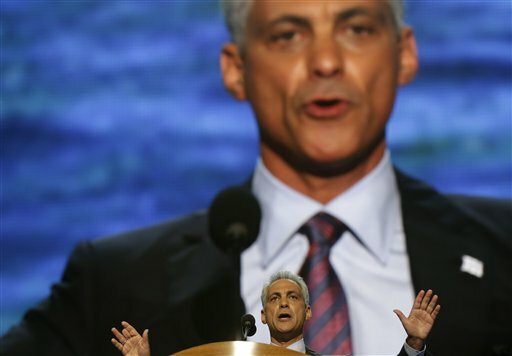 Of course, all eyes in Chicago were on Mayor Rahm Emanuel, who took to the stage to assail the Romney campaign and herald a second term for Barack Obama while side-stepping inconvenient issues – like the spiraling violence and impending teachers strike – that await him at home. Tuesday I mentioned the hypocrisy between Rahm’s place in the party and his anti-union stance. That hypocrisy was underlined in Rahm’s speech, with repeated references to Obama’s support of the auto and steel industries, two very union-heavy industries, something that doesn’t jive at all with his anti-union stance with teachers. (This may help explain why Rahm is so popular with conservatives.) Between the anti-union stance, the tight ties to Washington and his disregard for doing things any way but his way, the current mayor is beginning to sound a whole hell of a lot like the old one. Also: Remember when I pointed out that the CTA was trying to spray Febreze on its stink-pile of a “de-crowding plan”? Lots of people agreed and they made themselves heard at a public hearing Tuesday night. The hearing — the only one the CTA is holding on the matter, apparently in hopes no one will notice — was full of riders from around the city blasting the plan and the research the agency used to rationalize the cuts. Fewer riders defended the move to “de-crowd” rail and bus lines. But as I pointed out before, these “improvements” don’t even get services back to the level of pre-2010 cuts; instead, they actually take away routes. The CTA can bedazzle the plan all it wants, but underneath the spin, the plan is still just a crap sandwich being fed to commuters. And then: The announcement that Steve Edwards is leaving WBEZ in two weeks is newsworthy, not only given where he&apos;s going (to join David Axelrod’s new Institute of Policy at the University of Chicago), but because of the radio void he’ll leave. (And, yes, I am completely biased, having made a few quick appearances on his current show, The Afternoon Shift.) He’ll certainly be missed on the radio but it’s hard not to feel good for him regarding his new position — it&apos;s well-deserved. RIP: Former North Carolina congressman Charlie Rose, a Democrat and great defender of tobacco farmers, at the age of 73, from complications due to Parkinson’s disease. While Rose was far more liberal than some of his fellow party members from the South, he did break with the party over a proposed hike in the tobacco tax that would have funded the Clinton administration’s health care plan. He retired in 1996. Parti Quebecois, the separatist opposition party in the Canadian province, won enough seats last night to take control as a minority government. A victory speech, though, was marred by a shooting that left one dead. The Pentagon is alleging that the book by ex-Navy SEAL Matt Bissonnette about the raid that killed Osama bin Laden contains classified information. Ahead of his appearance tonight at the DNC, the New Yorker takes a look at how Bill Clinton’s relationship with President Obama has evolved. McDonald’s is opening vegetarian locations in India, proving that it’s possible to make even vegetarian food grossly unhealthy. Here’s a good example of how these public marriage proposals have gotten out of hand. Deliberations start today for the jurors in the Drew Peterson case, meaning we’re one step closer to this case dragging on for years to come. A federal jury ruled in favor of former Cook County sheriffs who alleged they were fired by Tom Dart as retaliation for supporting Dart’s opponent in the 2006 election. “What about us?” wondered the ghosts of thousands of Machine opponents from the last 100 years. To the surprise of no one, Mike Madigan is now pondering waiting until January 1 to shove through his pension reform plan without a single GOP vote because he’ll need fewer votes to do so then. A new project likely means the end of two Rush Street bars, Jilly’s and The Back Room. Some bummer news if you enjoy apple picking. Notre Dame radio announcer Allen Pinkett has had his foot-in-mouth-induced suspension extended by two games. Rejoice! Ozzie Guillen is back on Twitter. Sox Watch: The Pale Hose caught a break last night, as a Detroit loss meant they wouldn’t give up any ground after being blasted 18-9 by the Twins. The notion of Kevin Love on the Bulls is so delicious it makes me hate myself for entertaining the notion because it will only break my heart when it doesn’t happen.